The best thing a singer can do is to prevent themselves from getting sick by being proactive. This can be done in a variety of ways, but the first step is to make sure you’re washing your hands on a regular basis. Every surface we touch is coated in germs and viruses just waiting to take us down. Ensure that you’re getting enough sleep, and that you’re well rested. Eat food that is nutritious and healthy, and be sure that you’re using your voice in a healthy way – no shouting, please! Do you have a sore throat? Are you stuffed up? These symptoms don’t necessarily mean that you can’t participate in a choir rehearsal. Just because you can’t sing, doesn’t mean you still can’t learn something at a choir rehearsal. Unless you are bed-ridden, you can still come to choir practice, and follow along with your music. This will ensure that you don’t fall behind, even if you’re unable to sing. This can go the other way, as well. 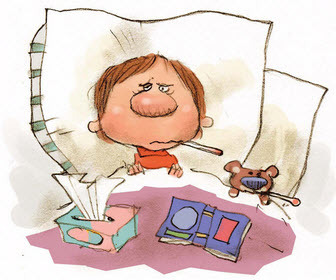 If you are very sick, and bedridden, then you should definitely not attend choir rehearsal, to prevent the illness from spreading, and making other choristers sick. Make sure you’re doing what you can to get over you illness as quickly as possible. This usually involves getting as much sleep as possible, and eating well. By taking good care of yourself, you can be back to your regular singing self in no time! How do you manage illness as a singer? Tell us in the comments below!